In the last blog entry, I contrasted Slavoj Zizek to Walter Benjamin with regard to the tension between tradition and the liquidation of tradition. Zizek follows one strain of Benjamin; namely, the liquidationist strain. Zizek prefers Benjamin’s “Destructive Character” and Benjamin’s notion of “Divine Violence” to Benjamin’s interest in preserving the tension between tradition and its liquidation. At the end of my last blog entry, I stated why I was interested in such a tension; namely, because Benjamin’s reading of Kafka and Don Quixote is based on preserving this tension. And, as I have been arguing, this tension has everything to do with the tradition of the fool and the schlemiel. To further understand what Benjamin sought to find in this tension, I would like to turn to an essay by Ernst Bloch entitled “Art and Society” (from The Utopian Function of Art and Literature, trans. and edited by Jack Zipes and Frank Mecklenburg). 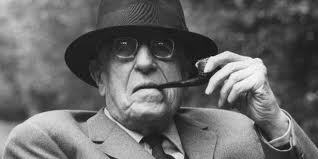 Walter Benjamin was influenced by and influenced Ernst Bloch. They had a productive relationship. They were interested in this tension as it pertained to the future – to utopia. For Bloch and Benjamin all works that emerge from the tradition are mortified. They are fragmented and are in need of future redemption. However, these works are not the works of the “victors” of history. Rather, they are the incompleted works of those who lost. These are the works of failures. And, for Bloch, they are ‘our’ heritage. In addition, cultural heritage only becomes what it is when the heir does not die along with its benefactor, when he stands on the side of the future in the past, when he stands with what is indelible in the cultural heritage and not with the takeover of parasitical rulers (46). Bloch calls for a “productive cultural heritage” and contrasts it to a “refined completion” of “the great work of culture.” For Bloch, a “productive cultural heritage” operates “as the successive continuation of the implications in the contellations of the past gathered around us as non-past.” In other words, we continue a tradition whose implications are present (non-past). Bloch calls heritage a chariot which “carries only that which has an order to be sealed.” To take this heritage on, Bloch says one must be strong. One may be overwhelmed by it. To be sure, the person is strong because s/he takes heritage and besides having the strength to continue it s/he invents (47). Bloch contrasts himself to Martin Heidegger who, in his opinion, created a “pseudo-philology and a pseudo-interpretation” of Holderlin, Anaximander, Parmenides, Plato, and Kant. According to Bloch, Heidegger’s relation to history was to “caricature” it. In contrast, Bloch argues that “genuine heritage is and remains precise and progressive transformation, and to be sure, a transformation of that immanent material in the material of heritage intended for completion without ideology, with implication”(48). The utopian function, however, is not based on envisioning, quite simply, the liquidation of history or heritage. To be sure, Bloch like Benjamin wanted to create a “cultural surplus beyond any ideology.” And the best way to accomplish this is to dig into cultural heritage. Namely, the heritage that many people might find insignificant or trivial. It is these failed elements that carry the charge and call for transformation. The interesting thing to keep in mind is that Bloch and Benjamin didn’t randomly choose this or that aspect of tradition. They were both interested in storytelling, fairytales, folk legends, and fools. Their heritage was plural. For this reason, Walter Benjamin and Bloch often drew on many different folk traditions in their work. I am especially interested in Benjamin’s reading of Kafka insofar as he starts his essay not with a meditation on Jewish folklore but on Russian folklore. And he ends the essay with a meditation on Don Quixote and Sancho Panza. Nonetheless, Benjamin doesn’t shy away from citing Jewish folklore as well. To be sure, he too was trying to create a cultural surplus and believed, like Bloch, in the “rectification of heritage.” And this is more than evident in his Kafka essay where, I would argue, the schlemiel and the heritage of the schlemiel emerges. Like Bloch, Benjamin wasn’t interested in liquidating tradition so much as in rectifying it. As I have already shown, Benjamin was aware of what is at stake with tradition. The question, however, is how we are to read the cultural surplus (vis-à-vis the fool) that Benjamin left for us and what we should do with it. Now that Benjamin’s criticism has nearly exhausted itself in terms of the obsessive reading of his work in terms of crisis and destruction, its time to dig up what has been passed over as irrelevant (the detritus of Benjamin criticism is to be found in the tension between heritage and its liquidation; it is to be found in the greatest comic failure of all and the tradition that gave birth to it: the schlemiel). In the next few blogs, I will sketch out more of Bloch’s project vis-à-vis tradition and utopia. The point of this exercise is to help us to understand Benjamin’s interest in Kafka, the schlemiel, and tradition. « Apocalypse Now – When Crisis Comes, Whither Humor?